This is harder than Positive Vibrations and of similar exceptional quality. If you thought Positive Vibrations was sustained, wait until you get on this! Pitches 3-6 rarely have a move easier than 5.10 and are steep, thin and exposed. In addition, most of the pitches are 160 feet or longer, meaning you need to conserve gear and manage your pump. The route is named after the striking "Sun Spot," a 40' x 80' section of red rock halfway up the face. The route has mostly thin climbing: fingerlocks, stemming, and occasional handjams. No pitches are runout, but there are a few heads up sections. 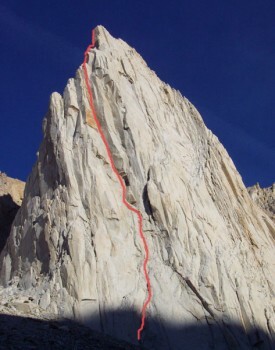 You should be able to cruise Yosemite's Rostrum before jumping on this route. Which SuperTopo guidebooks include a topo for Sun Spot Dihedral? The route as seen from the bivy spot. The route as seen from Maltby Lake.